Hartmannsdorf — December 14th, 2018 – One year after albis-elcon started first supply and installation of Ethernet Broadband systems in Mexico, the company continues to invest in the Mexican market, increases its local work team and opens a new larger office in Mexico City, La Reforma. The decision has been stimulated by increasing demand and business growth. In the financial year 2018 the business has doubled in Mexico and future expansion and growth are foreseen. 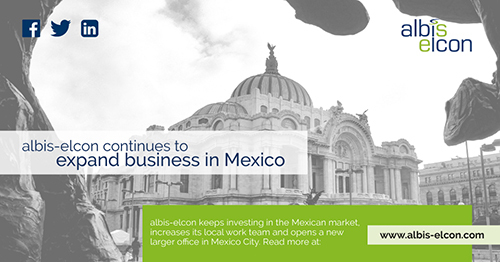 The trust in the Mexican market is so strong, the forecasts so convincing that albis-elcon plans to continue to increase its workforce in Mexico and bring more and new products and solutions to the Mexican market. ¡Por muchos años más de cooperación! albis-elcon supplies communications service providers with products and systems for fiber and copper data transmission and power feeding to enable broadband network deployment, IP network migration, and Internet TV distribution — all of which are fully-managed and software-controlled. With 15 million installed devices in more than 40 countries, the company is well-positioned to deliver superior-engineered hardware, software, network management, and implementation services. Data transmission was the beginning, software control is the present, and network behaviour prediction is the future. Data management is the focus. Customer satisfaction is the priority. albis-elcon — power to complete networks. More at www.albis-elcon.com.